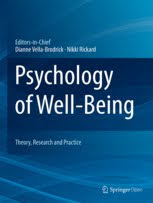 Our open access special issue on Positive Compuintg in the Springer journal, Psychology of Well-being is out! Co-edited with Dianne Vella-Brodrick, Pieter Desmet and Richard Ryan, this special issue has sought to bring together the positive psychology, technology and design communities to share interdisciplinary work in positive computing. The seven articles published highlight the multidisciplinary nature of work in the design and development of technologies for wellbeing, and the many varied and innovative approaches different researchers are taking.